There are times when your skin and mind long for harmonizing, strengthening care. Promote a sense of balance and well-being with this delicate, nourishing body oil. Rose Body Oil with extracts of damask roses and rose essential oil soothes, calms and protects sensitive skin. Jojoba oil maintains moisture for silky, supple skin. The soft rose scent soothes the senses. Light and refreshing scent. Felt wonderful on my skin. Great for massage. Will be ordering again and again. The scent is light but present. The texture is soft and soothing. It is good as a massage oil and quite lovely on the face. It works better when applied while the skin is still fairy wet post shower/bath. It even works well for my super sensitive dry skin. It took my itchy skin condition away! Rose oil has changed my face care plan. Finally, I discovered something that my face loves - what a difference! The rose oil is fantastic! I use it especially in colder months or when i feel like my skin is dull. The smell is amazing as well! Wonderful for dry skin. I actually use this in the winter time mixed with the rose day cream. Can't beat it for moisturizing my face! I love the smell of the Rose Body Oil! It is great for my dry skin. It is a pleasure to massage it onto my skin after a shower. An absolute essential for winter! Delicate and Powerful. A wonder! It smells wonderfully and delicately like real roses, no wonder, because it comes from real roses. It works effectively by making my skin nourished, supple and comforted. I use it year-round and any time of the day for the well-being of my body and my mind. This is a great body oil. I put it on wet skin and then just dab the excess moisture with a washcloth. Afterwards, the whole bathroom smells like roses! I love it. I am completely smitten with the Rose Nurturing Body Oil. It smells absolutely divine, like a thousand roses blooming. But not perfumey or overbearing. Just perfect-and I am very very sensitive to smells. The oil itself is exactly how it is described-nurturing. It feels warm on application. I like to rub it on my chest and feet before bed. and also rub it on my toddler's chest and feet before bed too. It is gentle and mild but very effective. Also, if I am feeling overwhelmed this aids in balancing my emotions-it just makes me feel better. Totally in love with this oil. This like being in a rose garden! This oil smells amazing and makes my skin feel so great. I tried this to see if the oil would work better on my dry, sensitive skin instead of my normal body cream. It wasn't bad and left my skin much softer than the cream does but my skin was a little sensitive to it. The fragrance is very subtle. Love this amazing body oil. I put it on while I am still damp from the shower. My skin feels amazing with no greasy feel and deeply hydrates my skin. I love the fact that it is natural since I am slathering it all over my body! Although I haven't tried the body milks/creams yet from Dr. Hauschka, this is my absolute favorite body oil/moisturizer of anything I've tried every. The subtle rose fragrance is so natural-smelling and perfect for winding down at the end of the day, or gearing up calmly in the morning. "Nurturing" is the perfect word for this product. I have all the body oils, but this one is my favorite! 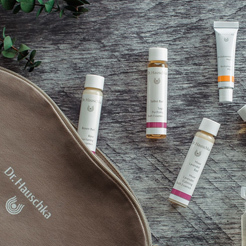 This is one of my favorite Dr Hauschka products. It's a good thing I like rose-scented body care with a name like Rose, and this one does not disappoint! I dislike the feeling of dry, tight skin I get sometimes in the winter after a hot shower and the Rose Nurturing Body Oil is the perfect remedy to my discomfort. The smell is gentle and feminine, the weight of the oil is light and it absorbs quickly. When I use it softens both my skin and my mood. Love the rose-scented body oil! I really enjoy the smell of this body oil. I use it as an all-around moisturizer. I don't wear perfume, so I love having such a wonderfully scented moisturizer. The natural ingredients are extremely important to me. I have sensitive skin and I like knowing exactly what my skin is absorbing! The oil does absorb well and doesn't leave a residue. I'm really glad I tried the body oils and I'm totally hooked! Soft and lovely rose oil is perfect for keeping skin soft and healthy, especially in the cold winter months. I love the scent of rose , I'm always looking for a product that is not overpowering in smell. This oil has a light frangrance. The body oil is amazing , I use it as soon as I'm out of the shower. The warm body heat helps the oil glide on smoothly. This oil soothes and moisturizes and absorbs quickly. I have used Dr. H. Rose body oil for several years. In the summer to soothe after sun/outdoor work. In the fall and winter as an extra layer on my maturing skin, and in winter as a base layer for Rose Day Cream, especially for being outdoors. In dry winter conditions I dab it over make-up and draw it through my hair. It's wonderful. Thick, fragrant. I put this on after a shower. It's very soothing for dry skin and has a wonderful smell that isn't overpowering. It is the best scent of Rose oil. Softness scent. I truly love the Rose Nurturing Body Oil. Immediately after applying, my skin is so luxuriously soft. And a bonus is that it smells so good. It's soft, delicate, yet not overly perfumed. I love adding this to my body cream. Makes it go on really smoothly and seems to help with my mature, dry skin. A hit! And last a long, wonderful time. I'm obsessed with this stuff in the winter. It smells amazing, and it soothes dry skin like a charm! My elbows get super dry in the winter, and a little bit of this stuff is a life-changer. I also use it on my legs after I shave and it makes them feel so amazingly soft. It doesn't leave a residue or leave your skin feeling greasy, which is a huge plus! This body oil is amazing! It smells beautiful and absorbes quickly so you don't feel too greasy. This product has helped my two year old daughter tremendously. She battles with eczema that travels to different parts of her body. This has been the only thing that relieves the red, dry, itchiness. Her skin is clear. We use it morning and night. Best right when she gets out of the bath and still has a little dampness on her skin. Love the smell! She loves it too! The body oil smells delightful applies smoothly and doesn't leave the skin greasy but feels moisturized all day. Please do yourself a favor and do not hesitate to choose this oil. Daily use has reduced the size of a skin anomoly by quite a bit. It would not be surprising if it disappears all together. Highly recommend this product. I used Hauschka products for more years than I can remember, over 25 anyway. When I lived in New England I used the Moor Lavender Body Oil in the winter and cooler seasons, with the Rose Body Oil in the summer. Now that I live in SoCal I use the Rose Body Oil more of the time. I am a gardener and love roses (I have 31 rose plants), so it was a natural for me. I slather this on after a shower, it smells lovely and absorbs right into the skin with no greasiness. For an at-home spa experience, after showering with Rose Nurturing Body Wash, gently massage Rose Body Oil into your still-moist skin. With your body enveloped in the delicate fragrance of Damask roses, nourish your face with Revitalizing Mask. Finish by applying Neem Nail & Cuticle Oil to fingernails and toenails.